Adventures in West Africa with Rob & Lois » Blog Archive » O-Bama-ko! A sticker seen on board a SOTRAMA, a window sticker in a taxi, an entire hair-dressing salon painted Obama-style and, on the market, there is no end of Obama shirts, belts and other merchandise! It is fair to say that, in recent times, the media have associated the predominant religion of Mali with a degree of anti-American sentiment. Well, there’s little evidence of this in Bamako – where there are almost as many stars and stripes to be seen as in Washington! 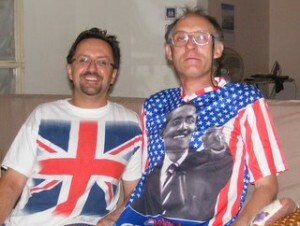 My friend Clive, on his recent visit, made the most of this and got himself an Obama shirt. I, as you can see, remain faithful to my own country!!! 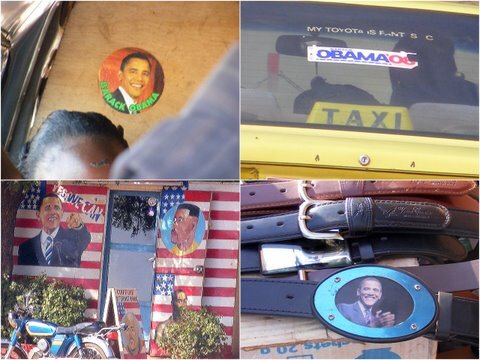 Don’t forget that I also found Obama goods for sale on St Albans market last year (post here), so it’s not just a Mali thing! I said that Obama’s face is only the SECOND most popular face around the city. So, QUIZ TIME! Whose face is seen even more often than Obama’s?? Folk who live in Bamako are barred from answering – the rest of you, have a guess (tricky one, though). Clue: Revolutionary. 1 Comment posted on "O-Bama-ko!" With minimal knowledge of Mali gained via the Internet, what about President Amadou Toumani TourÃ©?